Spectacular public performance - JAWMAX the new mobile compact class made by SBM. The single toggle jaw crusher type STE 100.60 ASV is the centrepiece of the plant. Two innovations assure more safety. On the first hand the new overload protection function prevents that "unbreakable parts" damage or blocks the crusher. On the other hand the crushing gap is opened by the automatic gap adjustment, the part can safely leave the crusher and the moveable crusher jaw moves back to the pre-defined home position. The crushing process can be continued without any further delay. Additionally, direction of rotation and speed can be regulated fully automatically by the control. At a throughput capacity of up to 200 t/h STE 100.60 ASV masters feed sizes of 950 mm x 550 mm which can be processed to a final grain size of 0/32 mm-0/200 mm. 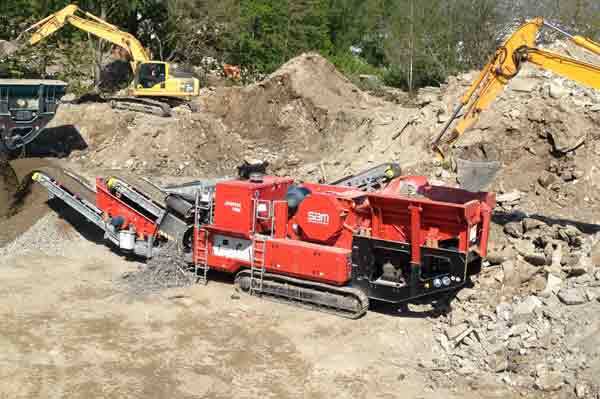 Due to the improved pre-screening with conical vibrating grizzly bars the material is efficiently separated even before the crushing process has started. As a first, SBM supplies a compact mobile jaw crusher plant plus screening unit to obtain homogeneous screening results in one step. The single-deck circular vibratory screening unit with the dimensions 2,700 mm x 1,200 mm can be provided with various screen linings assuring oversize-free final products suitable for immediate further processing. Easy to handle transport dimensions and environmental friendliness complete the package of benefits JAWMAX. Its transport dimensions of 10 m x 2.6 m x 3.2 m and a total weight of 29.7 tons allow easy and economical transportation on standard flat bed trailers ensuring maximum mobility here as well. The diesel-electric drive concept and the electric track drive score with improved efficiency and reduced oil consumption in comparison to hydraulic systems.